The Queens Head was built in 1744. High up on the building is a date stone which reads 1744 with the letters ‘SRS’ underneath. This pub did not change landlords very often. In 1821, Ann Curtis was licensee, followed by the Hardisty family who were there for around 40 years, James Lambert, Harry Roundill, Mrs. Ann Emsley, Margaret Crossley, Alfred Chew and in 1927 by Alfred Butler until his retirement in 1951 and who died in May 1953. Ownership has changed several times and in December 1920 a Mr. & Mrs. Wilkinson agreed a sale to Mrs. J. Newall. In 1877 the property was sold by Samuel Hardisty and his mortgagees to Jonathan Bailey, and in 1882 it was conveyed to Ann Emsley. In 1892 the property changed hands yet again when the property was sold to Charles Ryder, Charles Francis Tetley and Charles Foster Ryder. 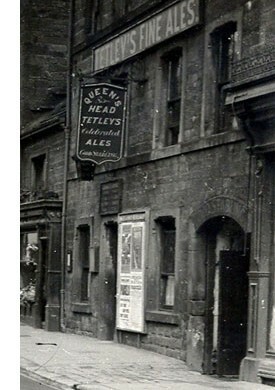 In July 1949, Messrs. Joshua Tetley & Sons proposed change of user of their premises from that of licensed premises to shops and office premises. It was decided that the Council would not object, on town planning grounds, to the proposed change of use of The Queens Head provided that formal application with required plans and other details be forwarded before any change was effected. It was announced in September 1955 that the former Inn would be offered for sale by Dacre Son and Hartley at a date to be fixed. The Licence of the Queens Head had recently been transferred to the new Ashfield Hotel on the north side of the river. When it closed in 1955 Rowland Wood was the last tenant. Two months later, the property was sold by auction for £5,750 to Mr. Walter Greenwood on behalf of the firm of men’s outfitters of which he was managing director. It was hoped that the alterations would be started after Christmas of that year. The property in 2012 is occupied by P.D.S.A.